PubCom's book division—PubCom Media—provides the best training materials for the accessibility industry by two leading gurus, Bevi Chagnon and Karen McCall M.Ed. Bevi Chagnon's thorough guide to making layouts in Adobe InDesign that export to accessible, complaint PDFs. 200+ page workbook with step-by-step details from start to finish..
Bevi Chagnon's cheat sheet for creating accessible documents (PDFs and Word docouments) per WCAG and PDF/UA accessibility standards. This cheat sheet is part of the core foundation materials in her accessibility classes for MS Office, Acrobat PDF, and Adobe InDesign. View more details about this cheat sheet. Order this book through our online bookstore. 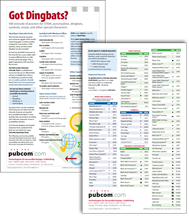 Got Dingbats? is a handy 2-page (one sheet, double-sided) guide to 101 of the most commonly used Unicode characters for STEM symbols, punctuation, dingbats, emoji, and other special characters for publishers. Also recommends OpenType/Unicode fonts with extended character sets. View more details about this chart. Books are not returnable or refundable. Electronic eBooks are available for download within 24 hours. The download token expires with 48 hours of your completed order. Print editions are shipped within 2-4 days of receipt of your order. We use 2-3 day ground shipping for the United States. Orders shipped to other countries will be charged at the going rate for shipping.